Waaay back in high school (circa 1985/86) I got a chance to spend 2 hours a day working with computers and robotics. One was just a robotic arm that integrated into the Apple ][+ serial port (and game port). 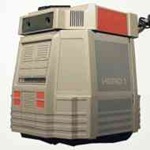 The other was the Heathkit “HERO Jr. (RT-1)” (Heathkit Educational RObot). It was really basic (simple 6808 Motorolla processor) but could move around and looked like it could have been on a Star Destroyer. Now they are re-releasing the HE-RObot in 2008 with much updated specs. 80Gb hard drive, standard Mini-ITX motherboard with an Intel Core Duo, runs Windows XP, webcam, CD-ROM drive, LED IR sensors and speakers. Better yet you can program it with Microsoft’s Visual Studio 2005 (no more basic or push-button macros). It seems that Heathkit teamed up with White Box Robotics who I’ve never heard of until now to bring this off. 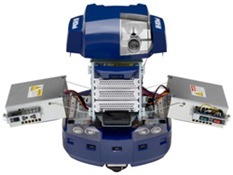 Their site has a PC-Bot which looks darn close to the new HE-RObot. 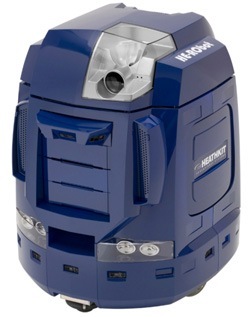 Unfortunately the PC-Bots costs range from $5,000 (no plastic, or mobo) all the way up to $8,000 (WinXP, .NET, complete). This out-prices this unit for home/hobby use. I hope Heathkit can find a way to cut costs and put it at say $2,500 (complete) which is still expensive. p.s. I’ve added a new “Robotics” category as this will be a major blog theme this year.